If you’re a small business looking to advertise on Google, you may be considering AdWords vs AdWords Express. Google ads can be a great way to drive traffic to your website. They display next to search results related to keywords that you set up ahead of time. You might also be aware that Google recently rolled out a new version of Google AdWords, the system by which you run ads on Google, called AdWords Express. Though definitely easier to use than AdWords, AdWords Express takes some important choices out of your hands that you might not be aware of. 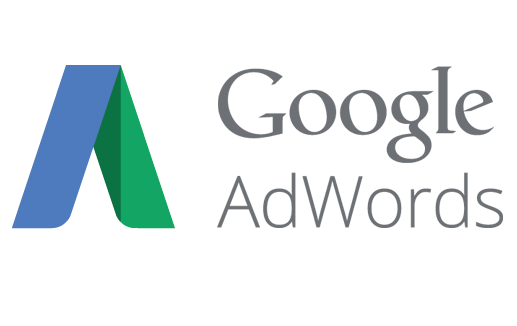 Below we explain how Google Pay-Per-Click (PPC) advertising works and then provide a breakdown of the differences between AdWords and AdWords Express. Essentially, AdWords is a giant clearinghouse of keywords you can bid on. When you create an ad, you’re prompted to enter keywords that are specific to your industry so that when users search for those keywords on Google, your ad pops up. When users click on your ad, they’re redirected to a specific link, typically a landing page for your company’s website. AdWords can help you get exposure for your business, especially if it’s relatively new and is not showing up as high on search results as you’d like it to. You only pay when people click on your ad (hence the term “Pay-Per-Click”). Depending on your industry keywords range from $1 per click to $50 or more per click, but the average is around $1-$2. Cost-Per-Click (CPC): The average price you’ll pay for each click on an ad. Budget: Your daily budget for ad spending. Click-Through-Rate (CTR): The rate at which users are clicking your ad, compared to how many times your ad displays. Keyword matching: There are actually 4 different types of keywords you can target in Google Adwords: broad match, broad match modifier, phrase match, and exact match. AdWords defaults to broad match, but that option is often the least effective route. In addition to paying attention to these metrics, it’s important to keep an eye on how they change over time, probably on a daily, or at least semi-daily, basis. Because many small businesses don’t have the time or expertise to run successful AdWords campaigns, Google created AdWords Express to automate this process. 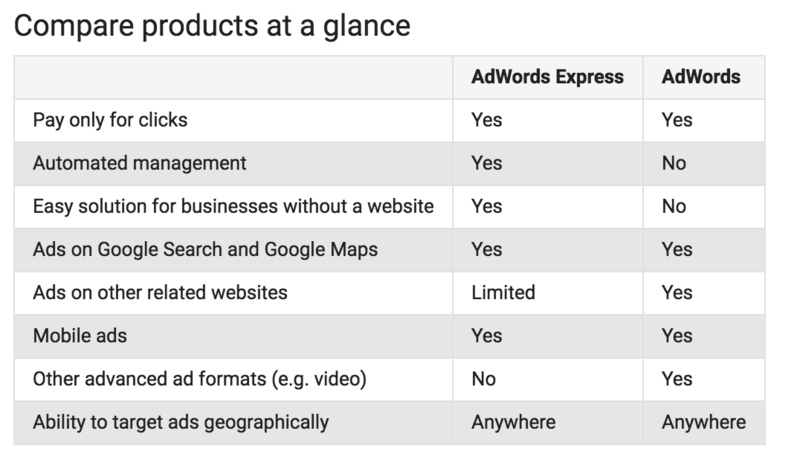 From this table created by Google, it would even appear that you’re getting more from AdWords express. After all, you get automated management and a solution if you don’t have a website. All you seem to miss out on is ads on other related websites and advanced ad formats. Where’s the bad? Like most automated systems, however, AdWords Express simply isn’t there yet when it comes to managing your ads. Our Cost-Per-Click (CPC) dropped by over 2000%: You read that correctly. The same ad running on AdWords cost 2000% less per click than it did on AdWords Express. Budget: We kept the budget the same to ensure reliability of the experiment. Click-Through-Rate (CTR): At the same time that our cost for running our ads went down, our average clicks went up by 800%. Remember when we said that there are 4 different types of keywords you can target when running a Google ad? And remember when we said that broad keyword matching was typically the least effective method? Well, what that table above doesn’t tell you is that AdWords Express defaults to broad matching. The reason this makes a difference is that there are such things as “negative keywords.” Negative keywords are so-called because they negatively impact the likelihood of your ad displaying. This is often because they’re too general. “Websites” would be a negative keyword for us, because we only specialize in WordPress websites, so people clicking on our ad from the keyword website might get frustrated if they want a website built in some other technology, such as Joomla! or Drupal. “Custom wordpress websites” is a much better keyword for us because it more accurately describes what we do. Because you don’t have full control over what keywords your ad is matched with in AdWords Express, you might find yourself paying more for worse results than you would with AdWords. Based on our experiment and some other research we’ve done lately, we will definitely be recommending to our clients that they take the time to learn the full version of AdWords or hire a consultant to run ads for them in that platform. PPC advertising is simply too complex to outsource key decisions to technology at this point. Perhaps in the future we’ll run our experiment again to see if AdWords Express has improved. Want to See if Your AdWords Campaigns Are Up to Snuff (For FREE)? Great comparison. How do we get Google to not default us to Express? Recently one of my client forced (almost) me to shift to AdWords Express from AdWords as they heard that Express one is going to be more profitable for their business. I told that AdWords Express will cost much more because all targeted keywords are broad match there by default. But finally I did what my client told me. Now they will know why I was reluctant to use AdWords Express. Yes, it’s always tricky when a client asks you to do something you know isn’t in their best interest. Ultimately, it’s their money, though. Let us know how it goes. Good luck! I had a similar experience with it when trying to advertise for http://happypuppyservers.com/, the Google agent didn’t even suggest I should use the full Adwords so I was not happy. It cost me $200 in 3 days even though my campaign was set to $4/day yet the leads were of very low quality (no conversions). Maybe one day they will fix the ROI on that system, but as it stands it is a money wasting trap. No arguments here! Sorry you had a bad experience. Let us know if you’d like to talk about some better solutions. The issue I think that wasn’t explained was that the system tries use the whole budget for the month with the remaining days of the month (3 days) regardless of the per day allotment. There might be some settings to prevent that, but they weren’t enabled by default. In the end, it all could have been avoided if I could figure out how to change my upper cost limit, but there didn’t seem to be any way to control it. I still haven’t figured out if that is even possible. I did switch to the full Adwords and had a much more pleasant experience there. I like all the controls and ways I can see what is happening and which keywords are drawing valuable traffic and how much clicks were costing me per keyword. Still, compared to Bing ads I found myself getting sub-par showings and very high costing clicks so eventually I had to shut it down. I still think Google Adwords outshines Bing ads with their more user friendly interface, but in the end that doesn’t help my ROI. You might want to engage us for our 1-hour free consultation. There are definitely ways to improve your cost-per-click in AdWords. Let me know if you’re interested and we can set that up. I have been using AdWords express, But switched to Adwords just now. It would be great if you could assist in the process. I work for a church that received grant money to use towards AdWords Express. I am new to the position, and have never used AdWords Express before (or AdWords for that matter 😉 ). We have some ads (free English as a second language classes) that have received a lot of clicks, and then some ads (advertising a charity run) that have received none. 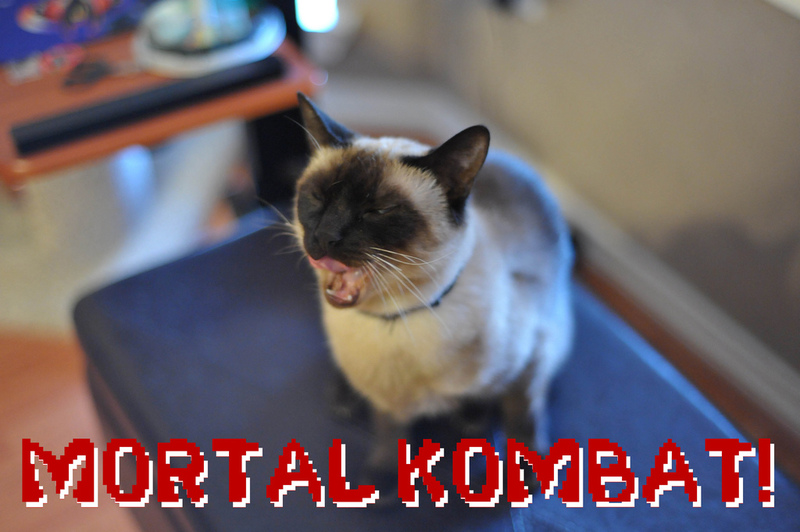 I want to make sure that our ads are effective and that we’re using this grant money wisely. Can you offer assistance with that, please? Absolutely. 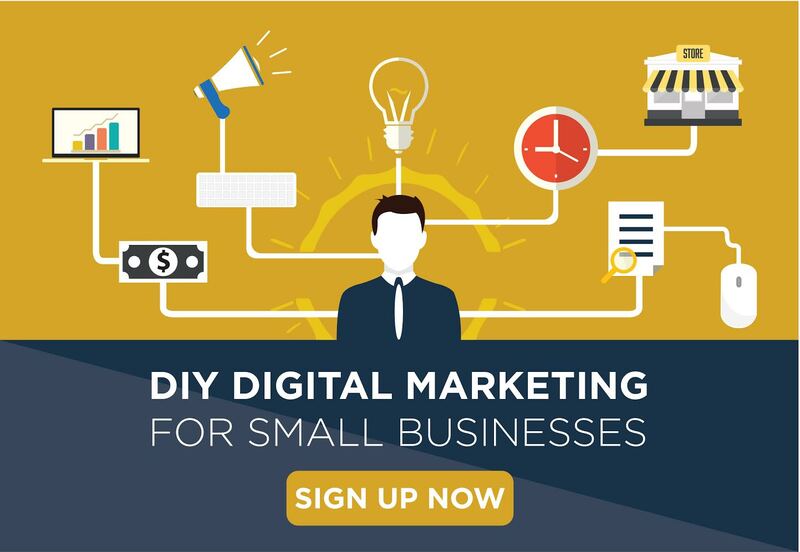 Please email us at guiseppe@contentgarden.org to set up a free 1-hour consultation. Here’s a different perspective! Worth a shot! You can contact AdWords customer support at: 1-866-2GOOGLE (1-866-246-6453) for United States. We’ve had to call on behalf of clients before. Typically the customer support specialists are pretty good at resolving issues. I´ve running an Adwords Express campaign for several months now: numbers seems nice, but the bounce rate which is about 70% is way too high and this ain’t right al all! I am more like a self-taught kinda guy. I tried before Adwords (the regular one) and looked overwhelming, with switches and bolts and lights everywhere. Seemed too complex for me to start the initial setup process, so when offered the Expreses version I jumped to the chances. Now I see why this was a bad idea. I will jump again to the regular Adwords and figure it about how to make it run. Thank you for this article. This has become my shifting point! You’re welcome! Please let us know if you need some help. Thanks! Education is a big part of our mission.